In a Notice dated April 21, 2015 the Union was informed that the Postal Service is cancelling the impact to the Philadelphia NDC and lifting withholding. It would seem that reason within management has resumed, at least for the time being. We would like to thank Branch President Joe Zelenenki and his team for their work during this process as well as NPMHU Regional Director Eileen Mills. If you have any questions or concerns please do not hesitate to contact Brother Zelenenki or this office directly. We are all facing our full share of challenges as employees of the United States Postal Service and members of Local 308 these days. This is something you really don’t need to hear from me as you live it each and every day you clock in and go to work. With an entity the size of the Postal Service there are all manner of indiscretions perpetrated against craft employees at every level of the organization. From the halls of “leadership” in Washington D.C. through the seven Area Offices and scores of Districts throughout the nation into to each and every mail processing facility and post office, the wayward and disenfranchised in management troll for potential bargaining unit victims. Do not be victimized Brothers and Sisters. Within the three districts covered by Local 308 we have more than 100 representatives prepared and poised to stand shoulder to shoulder with you as you face the inevitable assault on your contractual and legal rights and quite often your very dignity. While not all in management drool in anticipation of sticking it to the craft at every opportunity, there are enough malignancies within their ranks to make the eventuality almost certain. Require within the Federal Employees Health Benefit Program a set of specific health care plans that would fully integrate with Medicare and virtually eliminate the retiree health benefits unfunded liability. Adjust the FERS payment amount using Postal Service-specific demographic and salary growth assumptions and refund any existing surplus. Adjust delivery frequency (six-day packages/five day mail). Streamline governance model and eliminate duplicative oversight. Provide authority to expand products and services. Require defined contribution retirement system for future Postal Service employees. Require arbitrators to consider the financial condition of the Postal Service. Allow the Postal Service the right to appeal EEOC class action decisions to Federal Court. Click to read the full report to Congress. In ﻿this﻿ calendar year alone career Mail Handlers at the top step have enjoyed more than $2,100 in contractual increases. In an economy where the income for most working Americans is stagnant at best and actually shrinking in many instances, there are still those among us who do not see the value in belonging to this Union. It is incomprehensible to most of us that with the job security and wage gains we have negotiated through COLLECTIVE BARGAINING, there are still those who are not willing to fight to keep what we have earned. There are those among us who are not willing to pay their fair share of the cost of maintaining the wages, securities, and work rules that benefit and protect all mail handlers. They walk among us Brothers and Sisters and I urge you to encourage the misguided to JOIN THE UNION & JOIN THE FIGHT! For the second year in a row in a letter to National Secretary-Treasurer Mark Gardner, Local 308 requested that the scheduled $1.00 increase in membership dues be waived and that request was approved. As you know this Local is committed to returning our dues structure to that of similar sized locals, which is only possible through strict fiscal oversight and without any sacrifice in our ability to represent our Members. Representatives from three of the four Postal Unions including Mail Handlers, the APWU and the NALC along with our Brothers from the Laborers’ International gathered in Center City Philadelphia as well as Bellmawr, NJ, and Moosic, PA to demonstrate and inform the mailing public of the drastic and unnecessary cuts to Postal service standards. We thank all those who attended and encourage all Postal employees to contact their congressional representatives and demand that they stop management from destroying Our Service. 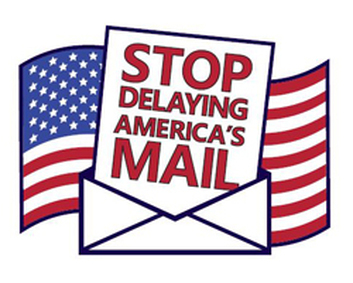 As closings and consolidations of mail processing facilities continue and the threat of further staffing cuts plague the employees of the Postal Service, our efforts in the legislative arena have never been more important. The ongoing destruction of our mail processing network as an alleged cost saving measure at a time when revenue exceeds expense, exposes, in our opinion, something a lot more sinister. Shrinking the network when our share of the package market increases makes little sense, yet this is the plan of the PMG. This is not the model of a growing business, but a blueprint for disaster and the end of the United States Postal Service as we know it. Read More. The American Postal Workers Union, Philadelphia PA Area Local # 89 and the National Postal Mail Handlers Union, Local 308 are jointly writing this letter with grave concerns regarding physical and verbal confrontations on the workfloor. Read More. Take the time to review the USPS' preliminary July financial report. Without the onerous and unprecedented retiree health benefit pre-funding requirement we are actually making money. This is obviously not consistent with PMG Donahoe’s version of reality. National Leadership Gathers in Washington D.C.
Click the link under Important Updates for a schedule of consolidations. Cost of Living Adjustments set at $1,227.00. The Cost of Living Adjustments effective September 6, 2014 (Pay Period 20-14) will add $1,227.00 annually to FTR career mail handler salaries for those hired prior to February 15, 2013. View updated pay scales. The commitment of those in USPS Headquarters to dismantle the great American institution that is the United States Postal Service really has no limits. With the recent announcement to reinstitute the Service’s Network Rationalization Plan, which would be more aptly named the "Network Irrationalization Plan", eighty four facilities across the country, including our own Scranton and Lancaster plants, will see reductions in operations and personnel. The implementation of this absolutely toxic agenda will ultimately lead to the destruction of the mail processing network, which appears to be the plan. More than 5,000 NALC Delegates from across the country gathered in Philadelphia for their 69th biennial convention as our own National President inspired our Sisters and Brothers in the Letter Carriers with a message of Unity and Solidarity. Joining Brother Hegarty in Solidarity at the event were our National Legislative and Political Director Bob Losi and Local 308 President John Gibson. Read More. The Union was notified this afternoon that the Postal Service plans to reinstitute the “Network Rationalization Plan” starting next year, in January 2015. You will recall that many of the plant closings and consolidations were put on hold earlier this year, in February 2014, when the Postal Service announced in the Federal Register that it was suspending any further implementation of its changes to service standards. On March 10, 2014 an historic agreement was signed by the Postal Union Presidents representing the Mail Handlers, American Postal Workers, City Letter Carriers and Rural letter Carriers. The purpose of the agreement is to show our solidarity, and to protect the invaluable institution that is the United States Postal Service. We call upon our members, and the American Public to join with us in this important endeavor. Read More.